Hanging hook and protective metal cage around ES fitting 60 watt (not supplied). Includes 5m of cable and plug. This luminaire is compatible with bulbs of the energy classes A+ to E. Toolstream. Work Light 5m 240V is rated 4.7 out of 5 by 7. Rated 5 out of 5 by Neil09 from Why didn’t I buy this years ago? I have struggled for years in the dark when I’ve needed to switch off the light circuit or just work in dark corners. There is only so much a head torch can do! 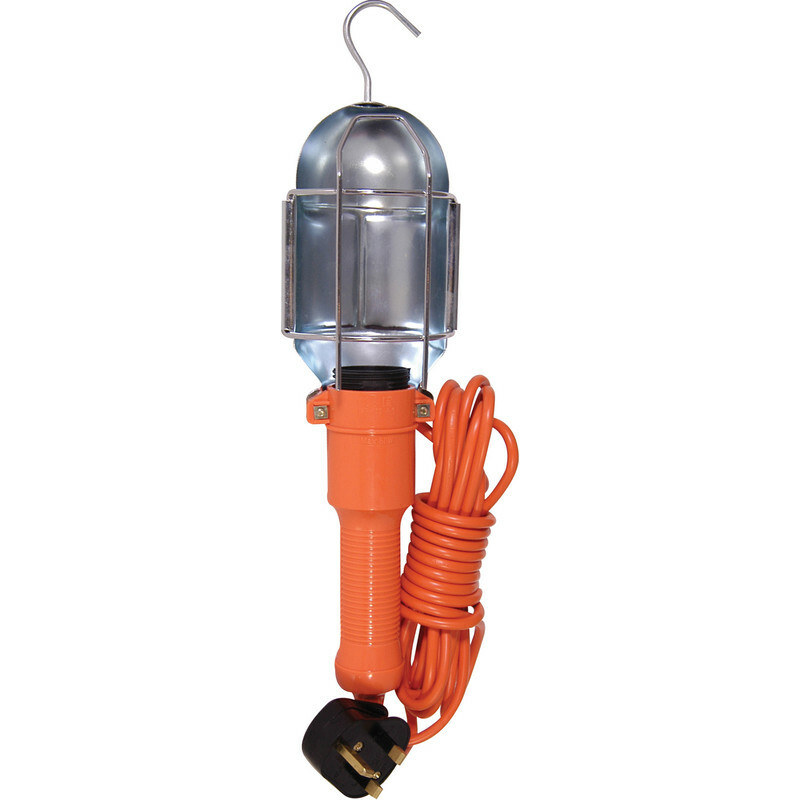 This little light is really good, with a handy hook to hang up. Has already made 2 jobs so much easier. Very pleased I bought it. Rated 5 out of 5 by Dav Cheat from Well made & good value Bought 2 as quite cheap but they are very good and recommend it for garages, lofts. Easy to position,feels well made. Need screw es 60 w bulb. Bit annoying it’s not included. Rated 5 out of 5 by VjsMK from Great for the price! Simple light unit with on/off toggle switch. Use it to put on a light in kitchen where I use an 11w LED light instead of putting the 4 X 60w spot bulbs on when boiling a kettle for a cuppa, or just need a background light, so it will pay for itself in time. It has a long 5m flex, a very useful hanger..what more could anyone want? Great! Rated 4 out of 5 by Joshopper from Useful extra light in loft I wanted some extra light in the loft quickly without the hassle & expense of getting new lights wired in. As we have spare sockets in the loft for our aerial booster I bought this light as it has a standard plug and takes an ES 60 watt bulb. Easy to hang from the hook and moveable so does a good job. Well made and good value. Rated 5 out of 5 by billyf from brilliant Brilliant so far, good level of light, hangs up well in the loft and the lead is long enough to plug in on the landing. Just what I needed. Rated 5 out of 5 by duffster11 from Useful and portable I bought this to keep in my shed and use when I need it. Its comes in handy for other times you want a portable light. It does get warm around the light but I would expect that.